CALL FOR PROPOSALS | Allied Productions, Inc.
Submission Postmark Deadline is January 30, 2009. 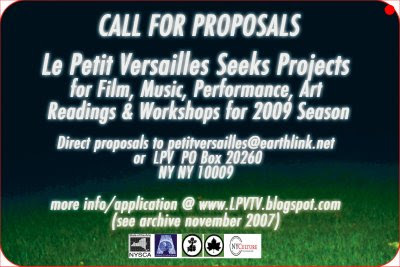 Le Petit Versailles 2009 Season – Call for Proposals. LPVwas created in 1997 by Allied Productions and other neighborhood members as a GreenThumb public garden located at 346 East Houston St. @ Avenue C. in the East Village. It is volunteer based and is dedicated to preserving the vitality of NYC greenspace through the arts, broadening & enriching the general public with performances, screenings, workshops and similar activities. The garden is approximately 22 x 60 feet -located between two buildings that border 2nd St. and Houston St. It has a formal unified design with an arbor with areas designated for seating and gathering. We recently constructed a small stage platform and additional bench seating. Electrical power is provided by Allied Productions. Total capacity in the garden is between 40-75 people. We will present 6 months of public events May- November. with music & film series, visual art exhibitions and workshops. We are looking for unusual ideas as well as more traditional presentations that address the environment, social and progressive issues and the site specific nature of the garden itself. Temporary installations, performances, films, workshops in any discipline are desired. Exhibitions must include works that can withstand the rigors of nature. We are also on the list of available sites for the community service proponent of the New York Foundation for the Arts Fellowship Program. Target audiences and communities include queer, people of color, gardeners, local neighborhood residents, artists and activists, from around the world. a. this form b. a one page (or less) description of the work you wish to present, include approximate running time, number of performers, and current phase of the work (experimenting, work in progress, fine tuning, finished work) c. one of the following: website, slides, Jpegs, VHS video tape, DVD, CD, or Audio tape of your previous work, or a version of what you would like to perform – cued to its best 3-minute segment. If you send a DVD or CD, write the track number or cue time here _________ d. Artist statement and/or performance group’s mission statement, or ideas that guide your work f. Performance resume (Individual and/or group’s) g. Self- Addressed Stamped Envelope with enough postage for the return of your images applications from outside U.S.: include international reply coupon h. Applications without a SASE may be considered, but will not be returned. i. Optional supporting materials: performance photographs. copies of reviews / previews / press. a score, script, or section thereof (no more than 5 pages). set and/or costume designs (no more than 2).